Old Town is a historic district on the North Side of Chicago and is home to a wide variety of old Victorian-era buildings. 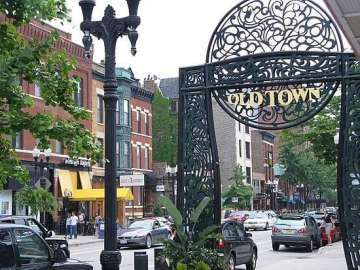 Old Town is a popular location because it’s so close to the lake and downtown. The neighborhood is just south of Lincoln Park and west of the Gold Coast. The area is filled with excellent small boutique style shops as well as many family-owned restaurants. Though it may be historic, Old town is also known to have lively nightlife with many bars lining Wells street. You can head on over to The Second City or Zanies Comedy Club if you need a good laugh. Old Town also hosts an annual art fair, one of America’s longest running art fairs, that displays over 250 artists’ work and includes live musical performances. This neighborhood is the perfect combination of old and modern.